Last major update issued on March 14, 2006 at 05:35 UTC. 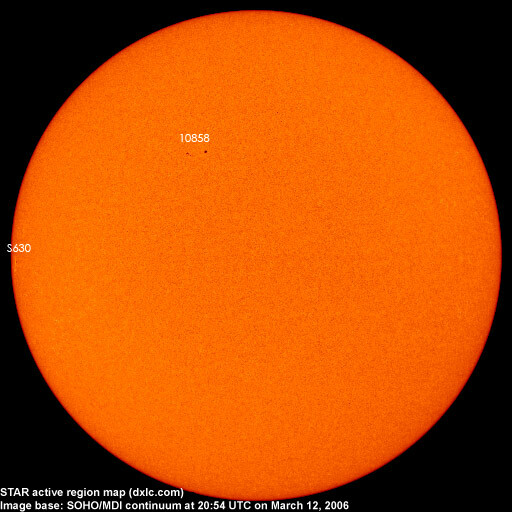 The geomagnetic field was inactive to quiet on March 13. 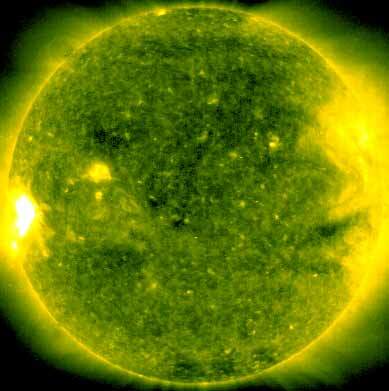 Solar wind speed ranged between 349 and 442 (all day average 374) km/sec. Solar flux measured at 20h UTC on 2.8 GHz was 72.6. The planetary A index was 3 (STAR Ap - based on the mean of three hour interval ap indices: 3.4). Three hour interval K indices: 00010122 (planetary), 00022000 (Boulder). Region 10858 decayed slowly and quietly. [S630] This region rotated into view at the southeast limb on March 12. Location at midnight: S03E63. [S631] A new region emerged in the southwest quadrant on March 13. Location at midnight: S07W66. March 11-13: No partly or fully Earth directed CMEs were observed in \LASCO images. The geomagnetic field is expected to be quiet on March 14-16. Long distance low and medium frequency (below 2 MHz) propagation along east-west paths over high and upper middle latitudes is fair. Propagation on long distance northeast-southwest paths is poor. Trans Atlantic propagation conditions are normally monitored every night on 1470 kHz. Dominant station tonight: WLAM Lewiston ME. Propagation was best to the east coast US states. Stations like 610 WIOD Miami FL and 890 WAMG Dedham MA were heard with fair signals while some of the 50 kW stations in New York had strong signals.